Rocket Singh is quite relatable in recent times. Half the day one gets uncalled-for calls from salesmen wanting to sell us products from the world. And in the other half almost every employee in any organization dreams of starting his own company like his workplace. Rocket Singh combines these common-man conflicts to come up with a compelling narrative. Harpreet Singh Bedi (Ranbir Kapoor) has always been a below average student and post graduation he desires to be a salesman. He joins as a trainee in a company that sells computers but goofs up in an early deal that invites him abuse by bosses and ridicule by colleagues. Relegated to his desk, Harpreet is restricted from going on field and realizes that his ideologies are not in sync with the so-called professionals of today. Soon he thinks of a way to get even with his boss Puri (Manish Chaudhary) and starts his own secret sales and service agency while continuing to work in his existing company. 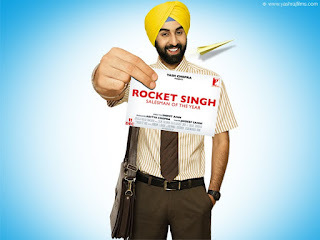 Though not designed likewise, Rocket Singh kinda starts where Wake Up Sid ends. The protagonist has just completed his graduation, has gained a sense of responsibility and is all raring to go in life. Ranbir Kapoor graduates both in terms of his character and as an actor. When the film is in the hands of a smart writer and skilful director, it can never go wrong. Rocket Singh has the correct combo of writer Jaideep Sahni and director Shimit Amin who team again to come up with another winner after Chak De India. Jaideep Sahni works towards sketching every character to real-life precision. And though these characters are extremely ambitious in pulling off clandestine commerce right under the eye of their boss, Sahni doesn’t make the screenplay look larger-than-life at any point. The trademark elements of Sahni’s scripting style can be sensed in the writing of Rocket Singh as well. On the lines of the team-building of Chak De India, Harpreet puts together a team for his undercover company. And like the ethical conning in Khosla Ka Ghosla, this team also tricks its competitor company, where interestingly they are employed. The detailing towards establishing the protagonist’s changing conflicts comes out convincingly in the screenplay. The dialogues are wonderfully effective with a witty punch in every line and a non-preachy management mantra in another. While any sales person or an average office executive can effortlessly identify with the setting of the film, director Shimit Amin doesn’t restrict the audience till them. He works more towards the human angle giving the film a universal appeal, while retaining its office authenticity. Harpreet’s field induction scene is smart and sassy. The pre-interval scene where boss Puri mocks and degrades Harpreet for his mess up is poignant. Like in Chak De India, Shimit thankfully refrains from the regular Bollywood tendency to liberally work out a parallel romance track. There is a love story which is kept short-n-sweet and is briskly defined through a transition song. Salim-Sulaiman limit the soundtrack to a couple of tracks which are either employed as transition songs or played in background, thereby not interrupting the flow of the film. Vikash Anshum’s cinematography and Arindam Ghatak’s editing are just perfect. Niharika Khan dresses Ranbir Kapoor in formal pastel clothing and colourful turbans making him look like the coolest Sardar ever on Indian screen. Rocket Singh offers Ranbir Kapoor immense range, as the character takes lead over the actor. He is perfectly poised in one of his best performances so far. The character-driven story doesn’t let Ranbir overshadow the supporting cast, each of who gets good scope. D Santosh is hilarious as the hardware service agent and gets the best repartees. Mukesh Bhatt as the office clerk is funny. Navin Kaushik as Nitin, the senior sales manager reminds of Raghu from Roadies for his cheekiness and is brilliant. Manish Chaudhary in a confident-personified act comes across as one of the most efficient negative leads in recent times. The one item-number-old Gauhar Khan surprises with an amazing natural performance and is a talent to look forward to. Shazahn Padamsee is charming but remains almost parallel to the plot and doesn’t get much scope. A line from the film states, “Risk toh Spiderman ko bhi lena padta hai, main toh phir bhi Salesman hoon” (Even Spiderman has to take risk, I am just a Salesman). The makers have taken as much risk to sell a not-so-regular story to the audiences. And it has paid off pretty well.